This Nashville based artist was another of those who thought Sam Cooke was a singer whose style was worth following – and who can blame him? I’m pretty sure his first 45 was the lively “You Should Have Been There” with its listing of soul stars in action, and his Chance 45 was in much the same rhythmic vein. I’m Surprised shows his fine gritty SC vocals off to good effect – the occasional baritone sax “burp” goes down well too. 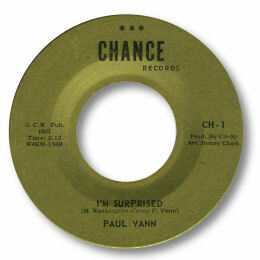 Vann’s move to SS7 brought better production values and access to superior material too. Taking All The Love I Can by Fred Briggs is a case in point – the bridge parts featuring strings and lovely tom-tom drum work being particularly strong. Allen Toussaint’s “Hello My Lover” is another song whose melody Vann handles with aplomb. 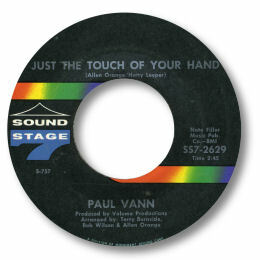 But his masterpiece is undoubtedly the tender ballad Just The Touch Of Your Hand which John Richbourg thought strong enough to warrant a double release, albeit under a slightly adjusted title. The backing track of strings, horns, studied piano and guitar fills make Vann’s job an easy one and his roughened vocals are quite superb. A triumph – but still not quite up to the standard of the astonishing version cut by Al Gardner in Memphis for Sir-Rah. 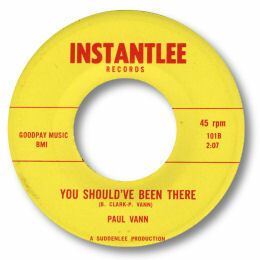 UPDATE ~ Dave Porter (see Links) informs me that Paul is brother to collected Northern soul singer Ila Van. Thanks Dave. NEW UPDATE ~ Producer/writer/singer Benny Clark has been in touch to say that "Paul was living in Manhattan,NY at the time that I recorded: "You should have been there" and "One Track Mind". Allen Orange heard these recording and brought him down Nashville to record only. He worked at The Museum of Natural History during the 70's." I'm grateful to Benny for writing to me - the Chance and Instantlee 45s that he put together are really first class. Watch out for Benny's new CD as well!